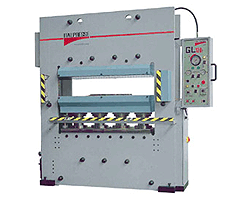 Italpresse is on the tongue of all when it comes to the manufacture of hydraulic presses. Probably the largest press manufacturer in the world, in terms of number of machines manufactured, the number of employees and the models available from one source. From a stand alone machine to a fully automatic production line complete with feeding and stacking equipment. Presses are manufactured for the Woodworking, Rubber, Plastics and automotive industries plus any other industry requiring a press. 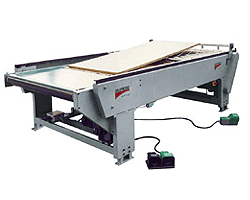 Illustrations 1 and 2 show membrane presses to apply Pvc foils to shaped substrate panels, such as MDF and Chipboard and transforms drab materials into decorative doors, panels and ancillary equipment. This process can also apply papers and veneers, creating the illusion of quality. There are many versions of a membrane press and Italpresse covers them all. The model "Transformer" shown in illustration number 1 will also transform into a hot flat platen press and a cold press. Illustration 2 can be supplied in various sizes and with one, two or three working trays to suit the production. Will produce high definition, enabling designers to full fill their dreams. 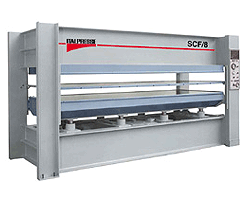 The most popular model of all the Italpresse range is the standalone hot press, model SCF. Many examples of this model can be seen in countless UK factories. 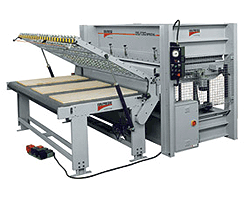 A very successful and reliable piece of equipment that produces quality panels day after day. The desired size of 1600 mm wide is classed as a special but is probably more common today than the 1300 mm width. Special sizes can be accommodated. Supplied with :- a) Fabricated steel platens for hot oil heating with an aluminium cover wear sheet. B) Solid Steel platens for hot oil heating or electrical resistance heating, with Mylar cover sheets to protect the platen surfaces. Can also accommodate steam or hot water. C) Aluminium platens for electric resistance heating. 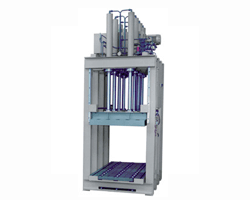 Hydraulic hot press, model: XL. This new model has been added to the Italpresse range from the demand for an excellent quality but cheaper press. Italpresse have invested many hours to this project and the end result is a press of robust construction, the latest technology in instrumentation and controls together with a completely revised method of manufacture. The main frame and component are now machined using CNC machining centres so that manual intervention during the assembly stage is down to the absolute minimum and coupled with mass production of standard size machines, Italpresse have achieved their goal of reducing the unit price. 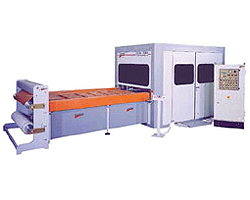 Standard sizes consist of 1300mm wide machines with a length of: 2500, 3000 and 3500 mm. 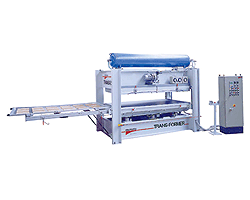 Larger pressing areas of 1600mm with a length of: 3200, 3800 and 4200 mm can be requested. As standard this model comes with all the usual optional extras as well as PLC control and diagnostics for general fault finding. When it comes to embossing presses for decorative paper-faced panels, the Automotive industry for car interior fascias and solid wood embossing, then Italpresse are world leader. There are many standard sizes of up or down-stroking machines which is the best route when it comes to economy but should you require something from the ordinary please let us know. The door manufacturing industry is well known to Italpresse, designing many systems for hot or cold curing processes. Illustration 5 shows the popular model :- PM/DE for cold curing doors or laminated panel stacks. Materials prepared in stacks of approximately 1000mm high are transported into the press on free running or motorised rollers and on cure completion are transported through the press, leaving the press ready to accept the next charge. Through feed presses are a very large proportion of Italpresse's production. Illustration 7 shows the smallest of the through-feed machines. Equipment for all industries is available on request from the small door manufacturer to the high production, large panel, producer. 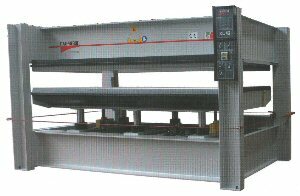 A typical piece of equipment frequently seen in the through feed press line is the automatic lay-up table that can place glued panels onto pre positioned laminates or veneers.